Membership: Lieutenant Smith, Dingo, Southern Cross, Nightfighter. History: A team of Australian heroes originally gathered together as A.S.I.O. 's special operatives, they were soon granted the status of an independent government department. 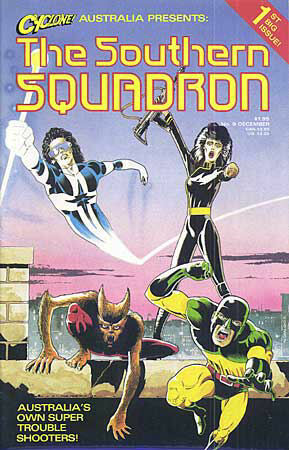 They form Australia's premier superhero team, dealing with any and all threats to their country. They have triple-A-one security clearance, a high-tech base manned by government personnel, and command of any Australian military equipment. Comments: Created by David de Vries, and drawn by Gary Chaloner. The team's government liaison is Colonel Rivers - he assigns them missions, and was instrumental in getting them their official status. He is also secretly the retired hero Crimson Comet.